I have long been fascinated by older sources of information because they often give a clear view into the past as seen from the perspective of people who were actually experiencing that place and time. In looking into the transition from the natural horn to the valved horn I came across several fascinating commentaries on the horn from late nineteenth- and early twentieth-century England. In short, more than a few musicians in this period "trashed" the valved horn, strongly favoring the then little-used natural horn. Many of these opinions appear in journal articles, orchestration books, and, especially in England, transcripts of various forums and association meetings. I have included several here that give us a series of "snapshots" of opinions in circulation at this time, covering 1879-1922. While the comments which follow sometimes seem quite humorous from today's perspective, they do reveal much about horn playing around the turn of the century and, reaching deeper, they say something about music perception and acculturation and at the same time raise interesting reasons as to both why some composers continued to write for the natural horn in this period and why natural horn performance is still important today. Music perception is a relatively new area of study in music, generally relating to how we hear or perceive music and sounds. For purposes of this article, acculturation will be understood as that aspect of music perception which is conditioned by individual experiences. An example that is easily grasped by horn players of what music perception and acculturation can involve may be found in the use of fingerings on the double horn today. Some hornists can distinguish the sound of a hornist playing into the lower and middle registers on the B-flat side of the double horn very easily. 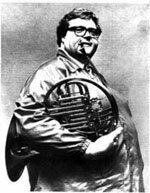 American horn player and teacher James Chambers (1920-1989, principal hornist of the New York Philharmonic from 1946-1969) commented in a 1982 interview that "I am constantly surprising students by telling them, without looking, that they are playing on the B-flat horn and that it really would be better if they would consider playing it on the F horn. ... the F horn sound is preferable." As Chambers implied, other hornists seem unable to perceive the differences in tonal color between fingerings, which Chambers found so obvious, while still other hornists who can perceive the difference find the tone of the B-flat horn superior to that of the F horn. Curiously, non-horn players, and especially non-musicians, are often hard pressed to note any significant difference at all in tonal color between any fingerings on the double horn. Read more: Trashing the Valved Horn? Students in the Belmont University Doctorate of Physical Therapy Program, Nashville, TN at the time this study was performed. This research was performed in partial fulfillment of their requirements for the Doctorate of Physical Therapy degree. Professor and Associate Dean, Belmont University School of Physical Therapy. Clinical electrophysiologist (EMG/NCS), Neurology Clinic, Blanchfield Army Community Hospital, Fort Campbell, Kentucky. At the time this study was performed, Dr. Greathouse was Professor and Chairman, Belmont University School of Physical Therapy and clinical electrophysiologist (EMG/NCS), Neurology Clinic, Blanchfield Army Community Hospital, Fort Campbell, Kentucky. He is currently the Director, Clinical Electrophysiology Services, Texas Physical Therapy Specialists, New Braunfels, TX and Adjunct Professor, U.S. Army-Baylor University Doctoral Program in Physical Therapy, Fort Sam Houston, TX. This study was approved by the Belmont University Institutional review Board. The authors have no financial affiliation (including research funding) or involvement with any commercial organization that has a direct financial interest in any matter including in this manuscript. Online Editors note: The online version of this article was condensed from the original (by the original authors) and lacks the figures and appendix mentioned in the text. For the complete article contact Dr. Greathouse at the address given above. 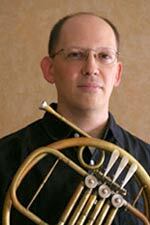 The embouchure is a remarkably complex area of a horn player's physique. Thousands of tiny muscles are manipulated to create the needed resistance against the airstream, which in turn creates the buzz. No matter how strong one becomes, there is also the risk of injury. This article will not speak directly to the issue of damage (on this subject, I highly recommend Bengt Belfrage's article, "Damage due to Overstrain in Brass Players" in The Horn Call XXIII/2 (April 1993): 21-24). Instead, it will focus on ways one can avoid the risk of damage, and actually make the embouchure feel consistent from day to day. In the summer of 1994, while making a solo recording, I began to feel a sharp twinge in my face, running down the left side of my nose, and ending at the corner of my mouth. Numbness and dull pain followed. I thought nothing of it, and continued to play, not realizing until later that I was pulling, or overworking that muscle. During nine months of difficult recuperation, I discovered what had happened was completely unnecessary and avoidable. Instead of being negative about it, I chose to see it as a blessing, and set out to create some ways of keeping my embouchure consistent and injury-free. I do not claim to be a medical expert; these ideas are just suggestions that may or may not work for you. As with all suggestions of a medical nature, however, please be sure consult a doctor or appropriate specialist. The important thing is to think about the present and future health of the embouchure, with this thought leading to positive action. Continued from The Horn Call XXIX/1 (November 1998), 65-67. "Practice intelligently," advises Richard Pittman when asked what he would tell amateur musicians who play in ensembles. "Tell them to practice hard and intelligently. They'll get more satisfaction from the experience by playing well." Max Hobart echoes the sentiment, "Tell them to practice, to be prepared." It's striking how consistent the advice is. Pittman has been music director of the Concord (Massachusetts) Orchestra for nearly thirty years and recently added the New England Philharmonic, also an amateur orchestra, to his schedule. He is also founder and music director of Boston Musica Viva, a professional contemporary chamber ensemble, and has been guest conductor of many professional orchestras such as the Kirov Opera Orchestra, the BBC Symphony Orchestras, and the American Repertory Theater. Hobart was a violinist in the Boston Symphony Orchestra and had already been conducting several community orchestras when he developed physical problems that forced him to give up playing the violin. Since then, he has concentrated on conducting, including the Civic Symphony Orchestra of Boston, the North Shore Orchestra, and the Wellesley Symphony Orchestra. Is A Beautiful Sound Really of Any Importance? The title of this little talk can perhaps be taken as a provocation; isn't a beautiful horn tone exactly what we are all striving for? Yet I ask this question because I am convinced that the tone we produce is the most unimportant aspect of getting the best result, and it must not be the focus of our problems and concentration. How often don't we say: "Oh, what an ugly sound he or she has!"? Do we really mean what we say? Couldn't there be something else displeasing us? Try to analyze: perhaps he or she has a hard or clumsy attack? Or there could be something else I haven't mentioned here. Anyway, if it is any of these characteristics or any other kind of playing behavior, it has nothing to do with the tone; it is the treatment of the tone. Read more: Is A Beautiful Sound Really of Any Importance?